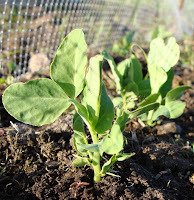 I sowed two half-rows of peas (Lincoln and Oregon Sugar Snap II) and a row of broad (fava) beans a few weeks ago. The sugar snap peas have all germinated beautifully, but there is no sign at all of the Lincoln peas or the broad beans. I went for the 'untreated' option on the peas, so maybe they just rotted in the soil (which was, I will admit, pretty wet when I sowed them). I've re-sown them all, although it is probably far too late to be sowing broad beans now. They are on the north side of the peas, which will give them some shade when it starts getting hot. Assuming the peas do eventually germinate, that is. The soil is at its (very transitory) Goldilocks stage of not-too-wet and not-too-dry at the moment. It is rich and brown: the texture and appearance make me think of Oreo cookie dough. I missed seeing the frogspawn in our seasonal pond, but noticed quite a lot of toad spawn in the permanent pond this morning. The seasonal pond is drying up fast and the tadpoles are being squeezed into a smaller and smaller space each day. Rain is forecast for the weekend (naturally), so I hope that will replenish the pond somewhat and give the tadpoles some chance of becoming frogs. Otherwise I can forsee myself feeling compelled to launch a rescue mission and having to ship tadpoles by the bucket-load from one pond to the other. It is interesting what we intend to do, to help nature along. Nice pea plants. 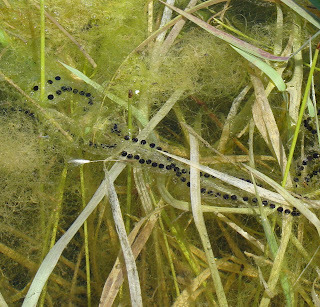 Totally cool, Amanda, that toad spawn. I've never seen it. We don't have much standing water right here, though there's plenty in bogs and wetlands on the north side of town. Sorry to hear about your peas. I actually pre-sprouted a lot of mine this year, as if I was sprouting alf-alfa seeds or something, so I'd know I was putting live seeds in the soil. The problem is that the roots are so crisp, tender, and vulnerable. I don't know if a pea can grow if the tip of the root has broken off, but I'll find out soon. Good luck with your re-plantings!